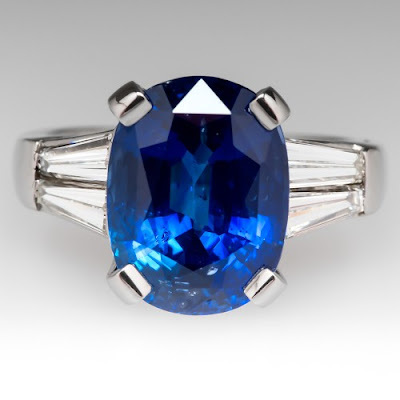 At EraGem, we love sapphires. The bigger and bluer, the better. This azure hue of corundum gets its color from an intrusion of titanium and iron in its elaborate crystal structure. Blue sapphires can range in color from pale sky blue, to royal blue, to deep sea blue. We are partial to the deep sea blue colors here at EraGem. Like the one pictured here, a gorgeous deep blue Sri Lankan sapphire weighing nearly 8 carats! Nestled in a four-prong platinum setting, this magnificent sapphire is accented by four channel-set tapered baguette white diamonds. This sapphire would serve well as a right-hand finger ring, though we think it would shine even brighter as a stunning engagement ring for a woman who values romance, purity, wisdom, and divine favor. Blue sapphires represent all that and more. In Persia, the ancients believed that the very color of the heavens was derived from the sapphire pedestal on which the earth rested. The minuscule (in comparison) raw sapphire stones found scattered across the land were thought to be chips off this grand foundation stone. Blue sapphires have long been associated with religious leaders, worn by clergy to enhance their connection to divine wisdom and favor. Non-religious spiritualists have sought the help of sapphires to aid in the acquisition of prophetic knowledge and to increase their ability to channel powerful energies. The ancients relied on sapphires to ensure fidelity, chastity, and temperance. Many Europeans during the middle ages believed that sapphire was the true blue gem, a gift of which symbolized the highest order of friendship, solidarity, honesty, and loyalty. This long-held association with fidelity has made blue sapphires a popular choice for engagement rings, as has its association with royalty. Sapphires and rubies were once held in as high esteem for royalty as the diamond, and blue sapphires continue to be a favorite among modern royals. Buddhists believed blue sapphires brought one closer to enlightenment and strengthened a postulate's devotion. Christians relied on sapphires to protect them from harm, particularly from poison, plague, black magic, treachery, and treason. They were also believed to provide wisdom, insight, and understanding to those who sought divine help. Blue sapphires are associated with academia, as well. Believed by some to be the Stone of Wisdom, these gorgeous blue gems were thought to inspire curiosity and to increase mental acuity. They were believed to promote self-discipline, activating the ability to order one's steps and reach one's goals in a methodical and conscientious manner. Today, they are associated with the psychology of the color blue. Blue is calming, bringing serenity in the midst of chaos and stress. The sense of peace blue brings can lead to the release of tension and clear the mind of negative thoughts that cloud creative approaches to problems. A blue sapphire, then, might open your mind to new thoughts, inspire contemplation of the beauty around you, and restore balance to your body and mind as you reflect on the mesmerizing rays of light emanating from within its faceted body. We cannot more highly recommend encountering a blue sapphire in all its glory. To do so, please call to make an appointment with one of our associates. It would be our pleasure to share with you the beauty of our selection of blue sapphires.